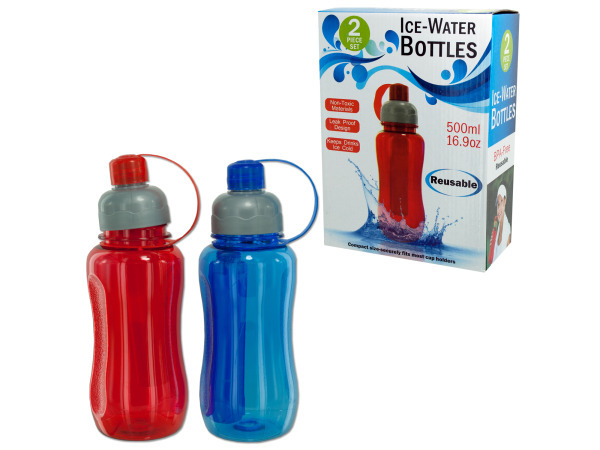 Perfect for cooling down at sporting events, hikes, picnics and more, this 2-piece Ice Water Bottle Set features leak-proof sport bottles that keep drinks ice cold with the provided freezer gel compartment. BPA free. Bottles can hold 16.9 ounces of liquid. Each bottle measures approximately 8 1/2" tall. Comes packaged in an individual box. 6 pcs. 12 pcs. 18 pcs. 24 pcs. 36 pcs.